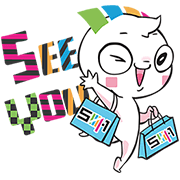 http://www.line-stickers.com/ – Nong Namnueng Line Sticker | Nong Namnueng is here at Siam Square One! Friend Siam Square Oneʹs official account to get the Nong Namnueng stickers. Available till February 4, 2015.